We were totally prepared. Everything we tried worked. Also speed kills. And that was essentially the key to the Gore Gore Rollergirls the champions from 2009 prevailing once again to win the Toronto Roller Derby finals for the year 2010 in the Battle for the Boot. 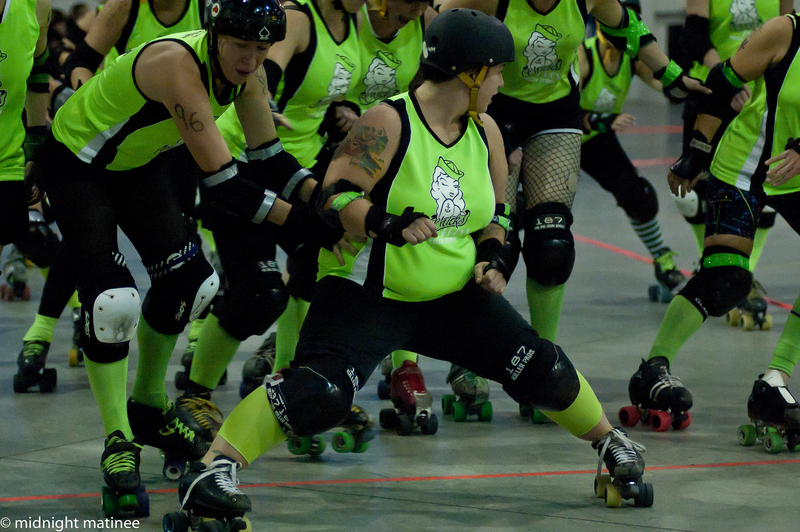 Last year it was GGR triumphing over Smoke City Betties – this time the Chicks Ahoy! who claimed the boot in 2008 fell in a speedy and physical battle before the sold-out Hangar crowd. Not only were tickets sold out online in a matter of hours tickets throughout the city disappeared to eager fans and disappointing others who could not get theirs. Adding to the atmosphere of the anticipation was the presence of the Rogers Cable television camera crew who were on hand to film the bout for a December 4 broadcast at 8 p.m. Announcing in their booth in the stanchions was Monichrome and some nerdy Derby person. Everyone in and around the Hangar seemed to be dressed in their finest including a certain Skinned Knee Crosby with a certain uniform on finally! Leagues from all around were representing, a triumvirate of three from Tri-City, a Thames contingent to see Classic Joker in his so-called final ToRD bout, maybe Hammer City, GTAR kicks and all and definitely the large pack all the way from Kingston! [Even with the presence of Rogers, lighting was still pretty dark, something that would be nice for the ToRD ladies to work on]. The night also hailed the announcement in the game programme for the next Quad City Chaos on March 26 and 27 of 2011. Teams to be announced? After warmups and waiting for the ticket crowd to finally make it through the doors while BDI put on an exhibition of her skills, the contest was on. Speed on speed and power vs power – but maybe Gore Gore Rollergirls had a little more guile and pulled a few of the slow tactics to control the game. However, with the first jam that netted GGR two points Bambi versus Candy Crossbones on the line the Rollergirls never looked back. 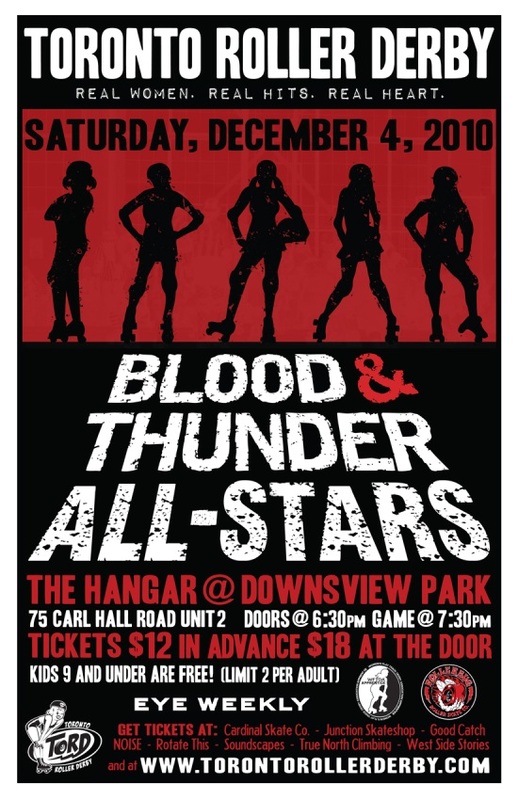 Jammer on jammer hits and slowdowns – the Rollergirls rolling Bambi, Dust Bunny [who the sidetrack announcer kept on calling Caitlin for some reason], Lunchbox against the rotation of Mach Wheels, Candy Crossbones, Dyna Hurtcha, Kari Mia Bere for Chicks Ahoy! 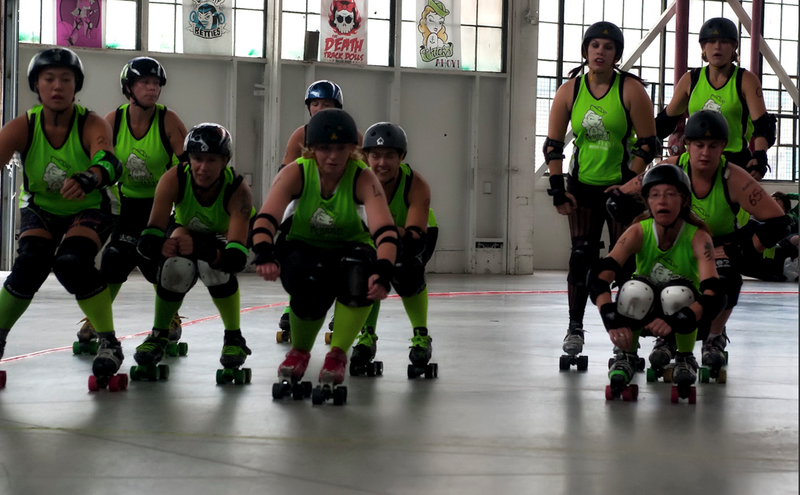 The bout was marred by Chicks Ahoy penalties – including a gross misconduct, maybe an illegal procedure – that got them into trouble in the box and allowed the GGR to slowly inch away. Chicks finally got onto the scoreboard with one point against 15 for GGR. Effective blocking by both sides kept the scoring runs down although the go for broke attitude resulted in big spills on the track. The score was remarkably low at 27 to single digit 9 in favour of the Gore Gore Rollergirls with four minutes left in the first half. The thirty minute intermission was an opportunity to hear The Cowbell Choir again who were at the previous semi-final with the Death Track Dolls and the Chicks Ahoy! Second half the margin was still only at thirty with a 46-16 lead at the 20 minute mark and counting down. The penalty troubles accrued for Chicks Ahoy! with them standing only with two players in the pack while they tried to fend off power jam situations that eventually sped up the Gore-Gore Rollergirls ascent up the scoreboard. With the Chicks Ahoy! 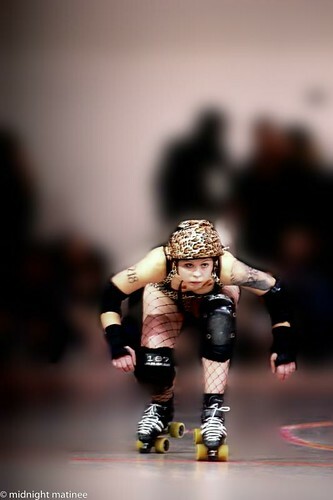 held at 16, the Gore Gore-Rollergirls were at 65 then 80 after a 15 point jam. GGR reached the century mark at 105-27 with two minute left and a final jam or two. Missing in action was Crankypants who in his other position in the world was at the Gemini Awards. Well la-de-dah la-de-dah. Actually if there is anyone who supports the Canadian arts it is he. Not to say that Mr Whistler and that was Hot Roller? did an evil job but no one cranks the crowd to GET LOUDER! LOUDER! than Crankypants. 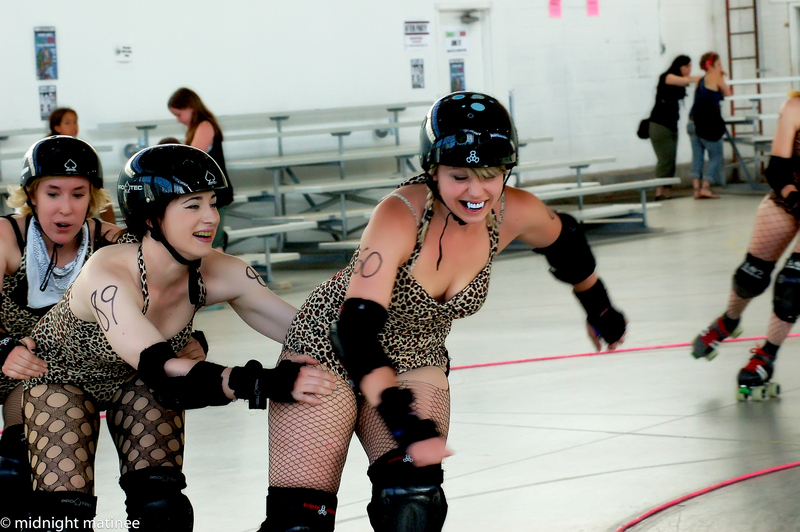 The inevitable last jam came and the Gore-Gore Rollergirls claimed the Boot amidst lots of hugs and cheers. Maybe the We Are The Champions music was missing. Meanwhile up in Tri-City on the Saturday afternoon the Luscious Lunch Ladies from Forest City stormed into the New Hamburg arena of the Thunder to take on the Total Knock Outs in a battle of rookie teams. The Luscious Lunch Ladies in another incarnation who had taken on Rollergettes of WEWRA and then Nickel City’s Sister Slag as part of the double header with Thames Fatales and Hamilton Harlots. Although the TKOs lost 72-26 they did TCRG proud and it’s just one step in their quest to dominate the world. Forest City may have something to say about that. Timmins Meet and Greet Come out to our First Skate and meet tonight Wednesday, November 24th 7:00-8:00 pm Mountjoy Arena. Please bring $3 for admission to the skate. And that marks the end of a season and our second ToRD finals. When we stepped into the world that November ago those finals were only the beginning in the year in the life of this so-called photographer trying to figure out what was happening on the track and prying our cramped fingers off our poor Nikon and knowledge out of those in the know. And remembering the focus of it all should always be those ladies fresh meat, new leagues or veteran teams alike on the track who are giving it their all. 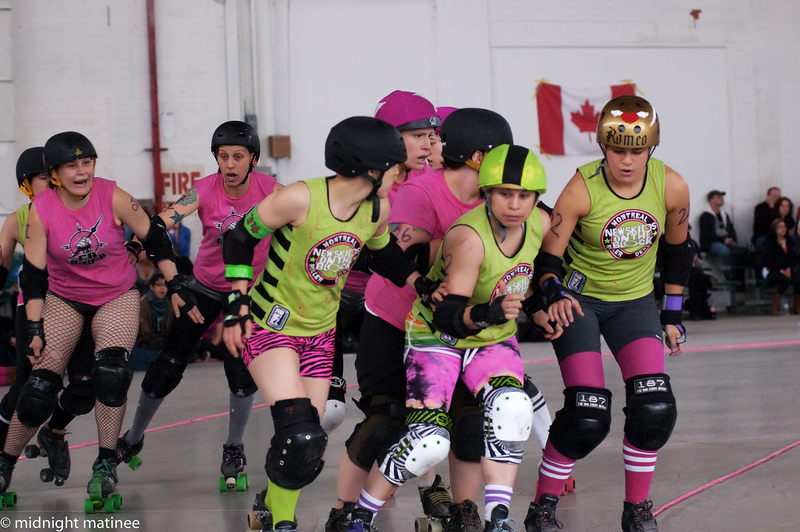 Take the talent from the team in CN Power pink and black and morph the team in green could what that transpires be a glimpse of the finals at Toronto’s The Hangar this weekend? The action is on the floor on Saturday in a celebration of ToRD – tickets sold out? Dig in the Tailgate party beforehand and enjoy the spirt that will be Derby and otherwise. Keep it behind lashes, can you make it last? This is an early friends and family bout to benefit the Food Bank of Waterloo Region. Doors open at 2:30 p.m., first whistle at 3 p.m. Admission is a donation of cash or non-perishable food item for the food bank!